The Second Boer War (1899-1902) was a grueling campaign which the British won despite their commanders rather than because of them. British commanders were in general of a poor quality in the war. Faced with Boer guerrillas fighting a careful, tenacious campaign for freedom from Britain, the forces of the empire would have struggled at first even under forward-looking and capable officers.Instead, they were repeatedly led by men of stunning ineptitude, who cost many brave men their lives and probably prolonged the war. Once an excellent major, General Buller had been promoted far beyond his abilities. He had also been away from the action, having not commanding any troops between 1887 and 1899. He was put in charge of the British expeditionary force to put down the Boers. With little grasp of his mission, Buller failed to direct the officers beneath him, even promoting the terrible General Warren. Buller’s undoing came in December 1899 at the Battle of Colenso. There he failed to identify where the Boer troops were, despite hurling artillery shells against the hillsides to try to drive them out. His advancing columns were devastated by the dispersed Boer riflemen. In this action some field guns were abandoned. Becoming obsessed with retrieving a set of field guns, Buller lost track of the big picture. By the time he gave in and retreated at eleven in the morning he had lost 1,139 men, compared with around 40 casualties on the Boer side. His setbacks earned the general the nickname “Reverse Buller” among his men. The bearer of another unfortunate nickname, was General Gatacre. He was called “Backacher” by his unhappy troops. Gatacre’s most notable disaster was when he tried to launch a surprise raid to seize the Stormberg railway junction. Taking 2,700 men on a hard night march, he failed to bring the one man who knew the terrain, leading his troops to become hopelessly lost. At dawn, Boer soldiers found themselves looking down a sheer cliff face at the lost British below. They opened fire, and those British soldiers brave enough to try climbing the rock face soon found it impossible. As his men fled, Gatacre ordered a retreat that descended into chaos. 600 men were left behind, not having been given the fall back order. Surrounded by the Boers, these men surrendered, while Gatacre ran off to lick his wounds. Approaching a hill near Magersfontein, Lord Methuen concluded that it was defended by Boers and took the sensible decision to bombard it before advancing. Unfortunately, he failed to find out where the Boers were before putting his artillery into action. A rain of shells fell on the top of the hill while the Boers sat safely dug in in trenches at the bottom. Believing he had shaken the defenders, Methuen ordered an advance by the Black Watch through a moonless night of pouring rain. As dawn broke, the soaked Scots found themselves marching in close formation towards the bottom of the hill. From 400 yards away the Boers opened fire. Most of the Highlanders leapt for the inadequate cover of bushes and anthills. The heat of the African sun and the bites of the insects added to their misery as they lay trapped. When the Light Infantry panicked and ran many of them were shot down from behind. Of 3,500 men who advanced, 902 were killed or wounded. Following Colenso, Buller was reinforced by troops under General Warren, who had spent the previous year in retirement. While crossing the Tugela, Warren spent so much time supervising the crossing of his own baggage that the 600 Boer defenders grew to ten times that number. Buller made Warren commander at the Battle of Spion Kop. Neither Buller nor Warren ordered proper reconnaissance of the hill they were planning to attack. With little purpose, plan or information, Warren ordered General Woodgate – a man even Buller considered stupid – to lead an advance. He gave Woodgate neither machine guns nor a telegraph team to keep in touch. Ill-equipped and ill-informed, Woodgate and his men fought their way to what they thought was the top of the hill, but was actually a plateau mid-way up. The Boers took the ridges and rained down death from three sides upon the British, who could not even dig in on the rocky ground. It was nine hours before Warren thought to send reinforcements, by which time Woodgate was dead and his men in retreat. When a war correspondent named Winston Churchill had urged Warren to act earlier in the day, Warren had ordered him arrested in a fit of rage. Buller’s failings at Colenso were compounded by his subordinates below him, including Colonel Long. Long was an old-school officer who believed that “the only way to smash those beggars is to rush in at ‘em”. Ordered to keep his horse artillery at least two and a half miles back, Long instead ordered them to gallop forwards, leaving behind the infantry meant to protect them. A thousand yards from the Tugela River, Long set up his guns in what he considered a pleasingly straight line and began firing at the Boers across the river. 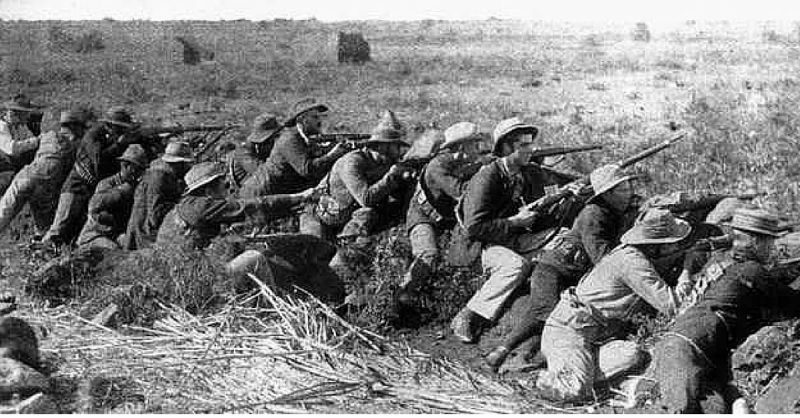 This close, Long’s men were defenceless in the face of a thousand Boer rifles. After an hour’s firing, with no ammunition left and no cover to hide behind, they were forced to retreat, leaving behind the guns, which were later used by the Boers against the British. Not to be outdone, another of the officers at Colenso, Major-General Hart, ordered his men to advance towards the enemy in close order in broad daylight. Unable to cross the swollen Tugela, he kept moving along it despite warnings from other officers of Boers all along the far bank. Surrounded on three sides by Boers, the British came under deadly fire. As his officers tried to move their men into open formations, and so reduce their losses, Hart ordered them back into close order and as a result he Boers were able to pick off many British soldiers with their rifles. Of 1,139 British casualties at Colenso, 532 – nearly half – were from Hart’s brigade. The Boer War turned into a bloody conflict. If the British Army had been properly lead then it would have been shorter and far less bloody. Geoffrey Regan (1991), The Guinness Book of Military Blunders.